Originally made for moving concrete to the pour, power buggies are now used for many different hauling jobs in a variety of industries: concrete spot pouring and spread dumping, construction debris removal, landscaping, material handling and distribution, on-site tool and equipment transportation, including cemeteries, golf courses, nurseries and agricultural operations. 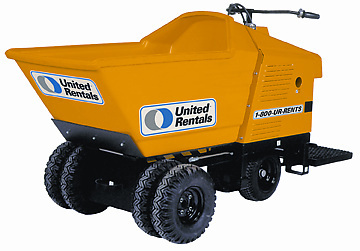 United Rentals’ power buggies feature a hydrostatic drive for smooth driving on flat terrain or inclines. And with no gear boxes, transmissions, drive shafts, drive chains, U-joints or clutches to break down or wear out, it’s exceptionally reliable.